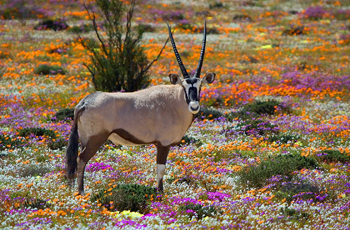 The phenomenon of South Africa’s west coast wildflowers occurs each spring when the arid, dusty earth of South Africa’s west coast bursts into fields of colorful flowers. White, purple, pink, red and flaming oranges create a tapestry of colour to create an annual phenomenon worth seeing. Fybos, vygies, daisies and nemesias are some of the hundreds of indigenous species that burst into bloom along South Africa’s western coast each spring. It is hardly surprising that thousands of visitors enjoy tours to the area between August and September each year to take photographs and to marvel at this natural wonder. The timing and amount of spring rainfall as well as the absence of warm berg winds determine the duration of the flower season, the amount of flowers and the quality of the flowers. While the last two weeks of August through to mid-September are regarded as the best times to do a tour to view the wild flowers, early rains can see flowers blooming as early as July. Good weather conditions (not too hot) allow the land to hold onto the flowers into October. The variety of flowers on display and flower hot-spots differ each year, varying according to the weather conditions. Tourist information centres in the region know the best locations and will gladly point you in the right direction. Use the West Coast Tourism website too for their ‘Flower Reports’. The wild flowers can be enjoyed through self-drive tours, on bicycle routes or on walks within National Parks and nature reserves. Tourist information offices in the region provide maps of flower routes so that you can plan a journey to flower hot-spots through quaint towns. One and two-day walking trails give you the opportunity to get close to the flowers - ideal for photographers and flower enthusiasts. Always stay on the trails and never remove plants, blubs or flowers from the veld (it is illegal to do so!). Sunny days are the best for flower viewing as the flowers open and turn their faces towards the sun; their petals remain closed on cloudy days. Use the early mornings to travel to your chosen destination and be ready for the best viewing, with the sun at your back, during the warmest part of the day (between 11h00 and 15h00). Although the flowers are the primary reason for travel to the west coast in spring, parks and reserves in this region are home to birds, antelope, other mammals, tortoises and an array of insects. While journeying along the Atlantic Ocean coastline, you may have the pleasure of spotting whales and dolphins too. Postberg Nature Reserve lies within the West Coast National Park and it is only open to the public during the flower season. Here flowers carpet the ground and the wildlife are as curious about you as you are of them. 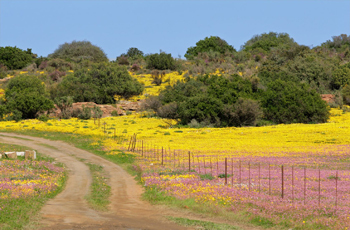 From Darling, the West Coast National Park and Clanwilliam to Vanrhynsdorp, Nieuwoudtville and onward to the Northern Cape towns of Garies, Springbok, Kamieskroon and Port Nolloth - including the Namaqua National Park, you can experience the west coast wildflowers. This annual phenomenon brings a riot of colour to the coast every spring and can be reached within a one to five-hour drive from Cape Town.